I’ve never been a fan of color on my lips: a lip stain of any sort was something I wanted nothing to do with. That was before I tried Revlon’s Just Bitten Lip Stain in Honey, which, for me, is an absolute revolution in terms of lip stains and lip products. I’m now a confirmed believer in the way a subtle color can work wonders for your beauty routine; the entire Revlon Just Bitten Lip Stain line is amazing and each color has its own practical application in my makeup repertoire. My absolute favorite, though, is Honey, which is the best for day-to-day use when you just need a little something extra to make your lips pop. Revlon is a major name in makeup, and for good reason. I’m always happy with Revlon products, and I’m not lying when I saw most of my lip products are made by Revlon. Just Bitten Lip Stains are Revlon’s most varied product, giving the user the biggest range of colors to choose from as well as being both a lip balm and a lipstick. Two for one! Can’t go wrong with that. Last I checked, there were 8 colors in total; however, Revlon is fond of changing things up a lot, so there may be more options available now. 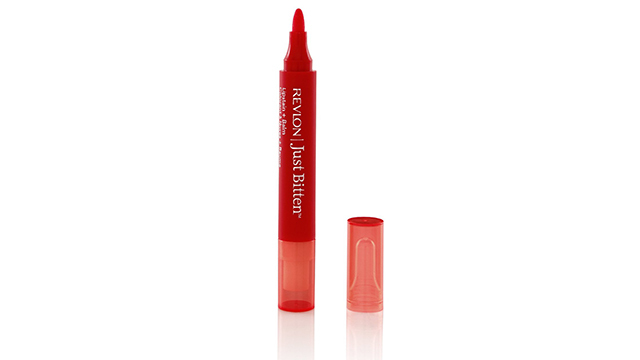 Just Bitten Lip Stains are available in a chubby pencil or a marker. The chubby pencil is similar to Clinique’s Chubby Stick; most people opt for the pencil rather than the marker, because the marker can lead to some serious drying on your lips. The chubby pencil has no such downside. The pencil comes in a retractable container, which is great because it means you don’t smush it every time you close the cap (which everyone knows is really annoying, and forces you to buy new lip products way more often than you want to – or can afford to!). It’s super simple to use it and you can get a good, even color on both your lips in just two or three strokes. The smell is somewhat minty, like a lip balm, but the smell fades within seconds and leaves behind amazingly soft, colored lips. It’s more like a lip balm than a lipstick, because it leaves your lips smooth and silky rather than caked or painted. The color is simply fantastic, just subtle enough but with enough pop to grab some attention. Honey in particular is a mild pink shade that is almost invisible with the first application; multiple applications will bring out its color more. The shade looks amazing on pale ladies, but there’s really no limit to who can use it, because you can really make the shade as sheer or as vibrant as you want it to be. You can also use them with lipstick as a primer or use them like a lip balm for chapped lips. Whether you like almost-invisible makeup or like to really stand out in the crowd, Just Bitten Lip Stain gives you control over your lip color.